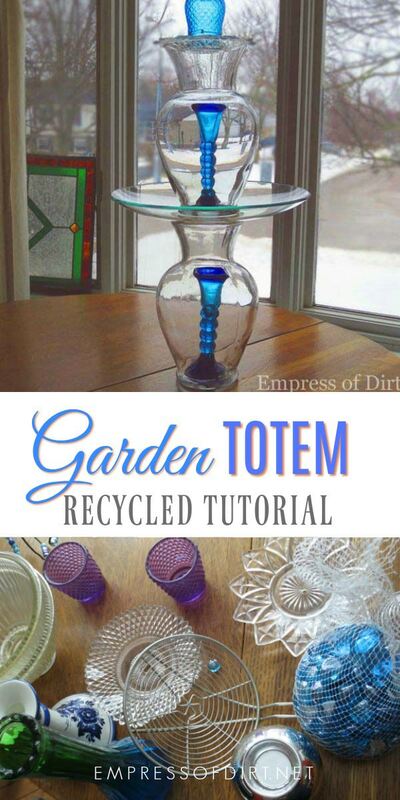 These garden art totems and bird baths are easy to make using various household dishes and glassware. Be sure to read the instructions to see the best adhesive to use for long-lasting, durable pieces. 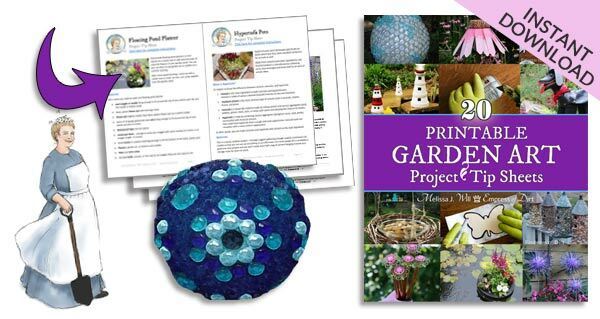 For more, also see these free tutorials for frugal and creative home and garden projects. 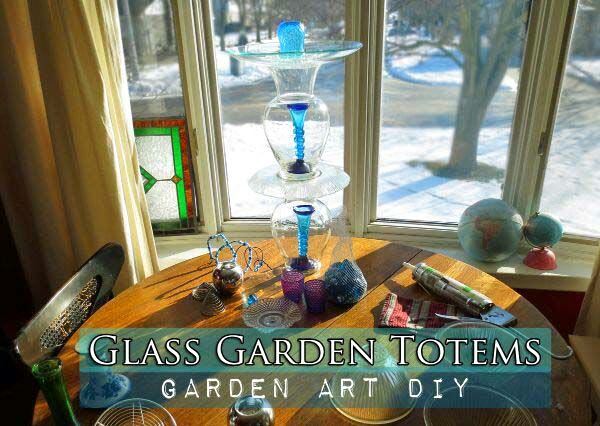 Glass garden totems are a great beginner garden art project. All you need is some used glass dishes, plates, vases, and bowls, the right adhesive (details below), and the desire for greatness. I often get asked if the glass totems ever break in the garden and the answer is no! 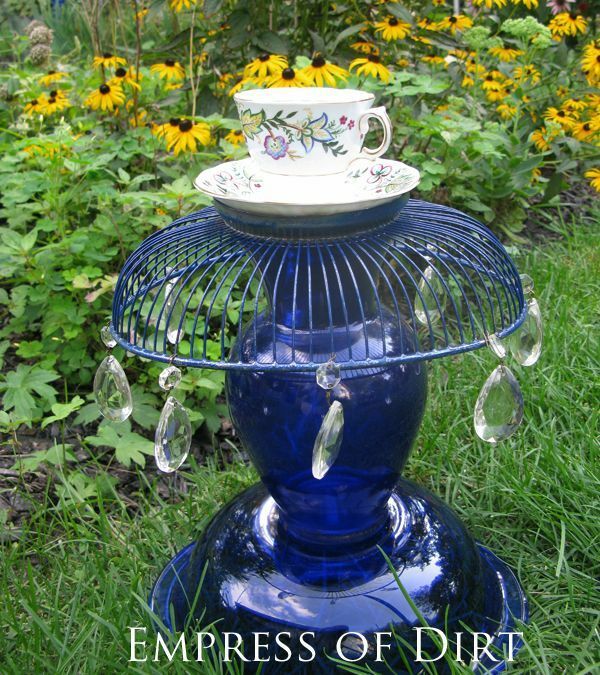 These garden totems are made from thick glass dishes. They can certainly withstand falling onto the ground (which is much softer than an indoor tile floor). Also, I keep my totems sturdy by burying the bottom few inches in the ground. This holds them in place but allows easy removal for cleaning or storage. Along with the written instructions, I have provided a video walk-through so you can see how easy this is in real time. Excuse how many times I say ‘um’ in the video. I have since learned to pre-plan what I want to say while recording a video. 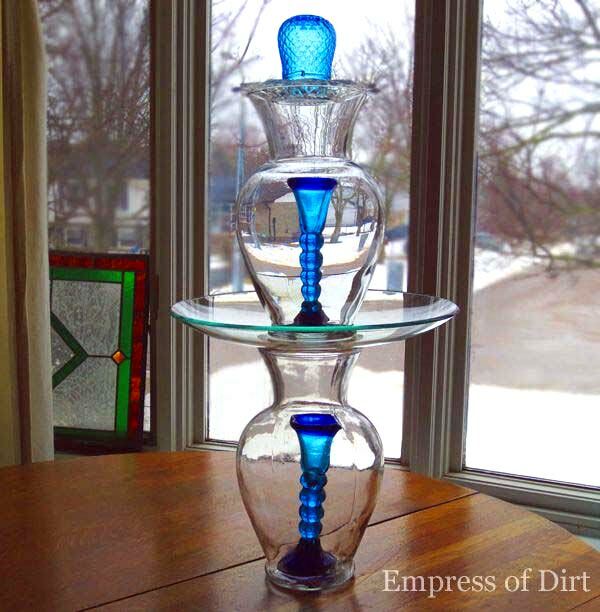 In addition to a decorative garden totem, you can also make a glass bird bath by adding a shallow bowl or plate on the very top. When dish shopping, please note that bird baths should be really shallow (holding 1″ of water or less) because birds can slip and drown in deeper water. Glass plates with 1″ lips around the edges work very well. Because I’m a fan of debt-free living, I challenge myself to find supplies at really good prices. I got these pieces for a grand total of $4.50 at the local thrift shop. I’m always on the lookout for durable glass pieces in any colours I like. Bold blues are a personal favourite. If you live near me and go to the same thrift shops, please pick a different colour to obsess over. Outdoor silicone sealant /adhesive. I use ‘CLEAR-drying’ (not white or any other colour) GE Silicone II. You can buy these in cartridges that use a caulking gun or in a squeeze tube. Despite the description, it does not dry perfectly clear. This stuff works so well, I don’t mind, but some people do. If you want a clear-drying product, see other recommendations here in my Glue Guide. Other garden art makers say they like E6000. It dries clear but I don’t like how runny it is. Check the product reviews of the sealant you choose and make sure the product is fresh (check date on label). 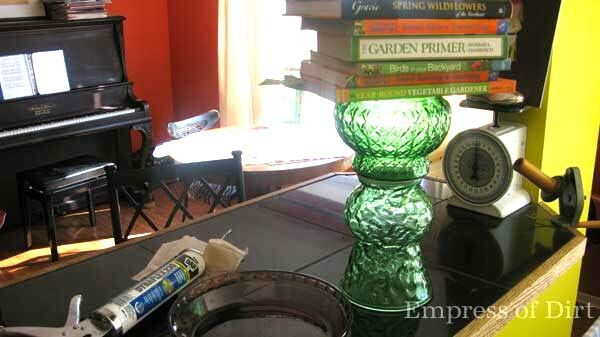 I have tips here to make sure your adhesive (really, it’s a sealant) will bond properly. Used glassware pieces you like. Check thrift shops, yard sales, your kitchen cabinets. Wash and dry the glassware and keep your hands off to ensure the surfaces you need to bond are not oily. Decide on the arrangement of your glass pieces: You want the surfaces you are joining together to be snug fitting. Some glass is warped, so test it out first. Use small glass plates to provide a flat surface between two vases that might otherwise be impossible to join. Work in sections: join items together in groups of two. When dry, join these units together. TIP: I keep an old comforter on the floor around the drying glass pieces so they won’t break if they fall over. It happens. You could embellish the surfaces with any weather-resistant items like flat-bottom marbles, coins, trinkets, and so on. Just make sure you keep the bird bath water area easy to clean and never use anything deeper than an inch or the birds can slip and drown. Follow the drying instructions on the adhesive label. When your totem or bird bath is ready, bury the base in a few inches of soil to hold it steady. You can also add some small rocks around the base if necessary. Did you use the GE II gutter sealant? We used it and it’s not clear, even though it says clear. Any suggestions? How do you keep the glass from steaming up on the inside thanks. I have tried this a couple times and with the same disappointing results. 🙁 I was using gorilla glue so wonder if that is the problem .. help please! Hi Marie, It’s all about humidity levels. There will always be some air sealed inside and it contains moisture. The more humid the air, the more moisture in there. Other than choosing low-humidity days or working in an air-conditioned environment, I’m not sure what else to suggest. Good luck! Thanks Melissa. When I do get this project completed I will post a pic. I will be on the lookout for a flat surface plate to use between the nubby dish and my vase. Will also check the exp date on my silicon. I am trying to use a glass deviled egg plate that has hobnail type nubs. This is on the outside of the dish and I can’t get the GE sylicon II to adhere to a smooth glass plate. I also tried to adhere a vase to this nubby plate. What am I doing wrong? Hi- is the silicone sealant really sufficient to glue the pieces? Have you every tired using to with glass and ceramics? Would the sealant work with both products and truly secure them? Adhere? Thanks! Yes, Ann, it works. I have used it on glass and ceramics. Some pieces have been outside all year round for over 10 years and it’s still going strong. Use it wisely, though: you cannot remove it. Hi Susan, I would guess from what you said that some humidity is trapped in there. Have not had any problems with humidity getting in the vases in the past several years. Made 5 new totems last week and 3 of them have collected moisture inside dishes. Is there any way I can dry up the moisture before I add more sealant around the outside edges. I’m assuming there must be a small leak. Anybody have any ideas. I really need help. Hi Maggie, I wish I had a suggestion but it’s just going to be caused by the humidity levels in the air: the lower the level, the less likely it will happen. You could use a blow dryer to evaporate what’s in there before sealing. Please tell me how to keep the wings (banana split boats) to the sides of a vase to make an angel. I can’t figure out how to hold them on until it dries. Thanks for your help. I have e-mailed several people with no response. Are the banana split boats and vase both made of glass? I have been having trouble with adhesion on my pieces. I will get the GE you suggested. Thanks! Great! It really is simple. I shot the video holding the camera while drilling so you know it’s easy! Hi Nora, The silicone sealant I recommend works as an adhesive in all weather and climate conditions. Thank you for making a video on how to do this; it was very helpful because I am a visual learner. My soon to be mother in-law wanted to make some of these and now I have a good idea on how to do it! And your tips are very helpful! Glad it’s helpful for you. Have fun! Hi So nice of you to record a video of instructions for the totem. I am going to make some! Wow finally a new way to use all those glass pieces I have accrued over the years!!! Gonna get the sealant and get to work; great ideas for gifts. Have fun Phyllis! I like the gift idea! How does one secure these in the garden? I can imagine wind, dogs, etc, knocking them over. I bury the bottom few inches in the soil. I’ve never had one fall over or get damaged even when squirrels jump on and off them. I like to dig out a shallow area and place a large concrete stepping stone or paver from the local big box store. Secure it by tamping down, then place bird bath or totem on top. Cover with enough soil or bark to hide the paver. We’ve got six cats who insist on jumping on our birdbaths to drink, so this method is well tested. Hi Melissa, I’m stopping by from Hometalk, love your glass vase totem, so cool and unique!! Hello Amy, Very nice of you to stop by and say hello! Wanted you to know this silicone sealant got terrible reviews. Hi Mikkie, I’ve heard of problems with various sealants, perhaps related to the age of the product. I’ve not had any problems with my projects *knock wood*- all done with GE Silicone II sealants.. It may come down to simply testing one out and seeing how it works. Thanks for your note. If adding a knick-knack to a birdbath with adhesive, should I be concerned with possible contamination to the water that would harm the birds? Hi Karen, Excellent question! I only use silicone sealant. According to the product information, It forms a rubber seal and does not leech into water (same as when it’s used for fish aquariums). Bird safety comes first, for sure. Good to know – thanks, Sharlene! Hi There, love the project ideas:) Make sure all seal, glue labels specifically say they are safe for aquarium use if you are going to use it for fish and other wildlife, pets etc. DAP and others say otherwise unless made for the aquarium industry. Usually they are made for the construction industry. Just to check and make sure. I have had to read the small print of many of them thinking they were OK, but over 99% are not. Most say they are NOT for that use in tiny fine print. LOL Sometimes I have had to go to a pet store to find the right silicone.